It’s that time of year again! It’s time to get started on your Spring Cleaning!! Open up your windows, let the fresh air roll in, and get your home clean and organized. You may wonder, “How in the world will I ever find time to Spring Clean my home? !” Well, you’re in luck. We have compiled a list of projects that can be completed one-by-one on Saturday mornings and still leave you time to do something leisurely in the afternoon; some of these will take only a few minutes! So, here’s a list to get you started. Your Dishwasher: To clean your dishwasher, first, you’ll need to clean out the bits of food, paper, and gunk that has collected at the bottom of the dishwasher. Then, run a cycle using a specialty cleaner. Alternatively, you can run a cycle with a cup of vinegar in a microwave-safe container on the top rack of the dishwasher. Forgotten Spaces: Dust all of those areas that don’t get addressed during your routine cleaning. Make sure to get the baseboards, lamp shades, etc. You can use a lint roller on your lamp shades. Move furniture and clean thoroughly behind it. You can also toss your curtains and throw pillows in the dryer for 15 minutes on the air fluff setting to remove dust. Papers: Gather all of those loose papers floating around your house, like that pile that’s been collecting on your kitchen table. Grab a trash can and some paper clips and get to sorting. It’s easy to categorize into stacks, such as school, work, medical, utilities, children, etc. File, store, and trash accordingly. Folders and filing boxes are an inexpensive way to help organize the papers you want to keep. Your Cabinets: Using your exhaust hood can help prevent grime from collecting on your cabinets. But your cabinets can still collect dirt from your hands and cooking. Use a damp cloth to clean your cabinets or cabinet cream for the even grimier cabinets! Your Windows: Clean your windows INSIDE AND OUT! For the inside windows, use whatever window cleaner you prefer. For the outside windows, you can use warm water with a couple drops of dish soap and a sponge. Then hose the windows down after washing. Your Refrigerator and Freezer: The best way to clean out your fridge and freezer is to empty everything out into an ice chest, sort through the food, organize the food you want to keep and throw away anything rancid. Remove the drawers and shelving from the fridge (don’t forget the doors) and wash everything down in the sink; some of these may even be dishwasher safe. It is a good idea to sanitize while you’re doing this, especially the meat drawer. Dry everything off and put your fridge back together. Fridge declutter will make cooking or finding a snack much easier. Your Bed: WASH EVERYTHING! Yes, the entire bed needs to be cleaned. Dust the bedframe and polish if it is a wooden frame. Clean the floor under the bed. Wash your sheets and pillowcases, comforter (following care instructions on the tag), bed skirt, and mattress cover. While everything is washing, get out your vacuum. Using the crevice tool, vacuum the mattress. Spot clean any stains and finish off my sanitizing the mattress using a sanitizing spray of your choice. Washing Machine: Does your washing machine have a funky smell? Even if it doesn’t, you can prevent this by cleaning your washing machine periodically. Fill the machine with hot water as high as it will allow, add white vinegar and baking soda, let sit 30 minutes to 1 hour. After it sits, complete the cycle and wipe out the tub. Oven: There are many known ways to clean your oven, from its’ self-cleaning setting to harsh chemicals and specialty cleaners. Here’s a cleaning method using tools you probably already have at home. First, remove everything from inside your oven, including the thermometer. Create a paste using ½ cup baking soda and a few drops of water. Using a glove, rub the paste all over every inch inside the oven applying extra pressure and paste in the really grimy areas. Allow this to sit overnight. While this is sitting, take this time to clean your oven racks. For the next step, you can use either a spatula or a damp cloth to wipe out all of the baking soda. Spray oven with a vinegar and water mixture, then wipe the oven down again. Microwave: Place either chopped citrus of your choice (lemon, lime, orange) or a few tablespoons of vinegar in a microwave-safe dish. Add one cup of water and place in microwave. Heat on high for a few minutes until the mixture boils. Leave the microwave door closed for 15 minutes and allow to cool. Take a sponge or cloth and wipe out the grime. Carpet: Vacuum all your area rugs and carpet. Make sure to get in all edges and crevices where the baseboards meet the carpet. If you have carpet stairs, vacuum the stairs. Use stain remover or club soda to work out those stains in the carpet. If you have access to a carpet washer, give your carpet and rugs a good wash. For most area rugs, you can take them outside, lay them over saw horses, spray them down with a hose, and allow them to air dry. Bathroom Tile: Using an appropriate cleaner or a mixture of baking soda and water, wash down all the tile. With a soft brush, clean the grout too. If you have tile that reaches up high in your shower, use a sponge mop and cleaner to wipe down the walls you can’t reach. While you’re cleaning the shower, replace or clean your shower curtain liner. To wash plastic liners, put them through the washing machine with a few dirty towels– that will help scrub the liner. Use ½ cup of detergent, ½ cup of baking soda, and make sure to use cold water! Closet and Drawers: Get in that closet and all of your drawers and REORGANIZE IT ALL! Sometimes, it is best to take everything out and start new. If necessary, add closet or drawer organizing boxes or baskets. While everything is out of the closet, vacuum, mop, and dust the closet floors and shelves. To make it easier to find the garments you wish to wear, organize them back into the closet/dresser by color or garment type (i.e. tank tops, short sleeve, long sleeve, jackets, etc.). Broom: This will only take a few minutes. Pass the vacuum along the bottom of your broom to get out all of that extra dirt and dust. You can even rinse your broom with warm water and dawn if you desire. By doing this, you will have fewer dust bunnies floating around while you sweep! Declutter: This is probably the most important spring cleaning to-do. Decluttering your home relieves an enormous amount of stress and allows you to have a clear mind. Grab a few trash bags or boxes and label them “DONATE,” “TRASH,” “SELL,” “RECYCLE,” and “KEEP.” The keep box will be good for items that are out of place in your home and need to be put away. Sort through all of your closets, drawers, cabinets, garage, and any cluttered area in your home. Once everything is sorted into its appropriate bag, get in your car and drive straight to the thrift store. Don’t let your bag of donations sit in the trunk of your car for 3 months (we’ve all done it.) And don’t let your sell bag sit around, either! List the items you want to sell online, and put away all of the items left in the keep box. Painted Walls: Take a damp cloth (can add a drop of dawn to water) or a magic eraser and wipe down all the scuffs, splashes, and stains on your walls. Make sure not to scrub too hard on painted walls. If necessary, touch up any knicks or marks that won’t come up with some fresh paint. This will freshen up your room in a subtle, but noticeable, way. Bookshelves: Take everything off of your bookshelves and dust the shelves. If the shelves are wooden, you can polish them, too. Before you put the books back, wipe them down first. Then place them back on the shelves in size order (or another order of your preference). Dust all the picture frames and tchotkes, and place them nicely back onto the shelves. Drains: Pour ½ cup baking soda followed by ½ cup vinegar down your drains, put drain top back on, and let sit for 30 mins before rinsing out. If the shower doesn’t drain well, follow the rinse with a drain snake to remove any hair or gunk that has collected down the drain. Vents: Remove all your vents and wash them off. You can either dust them or let them soak in the bathtub with warm water, then rinse. Replace any air filters that need replacing. 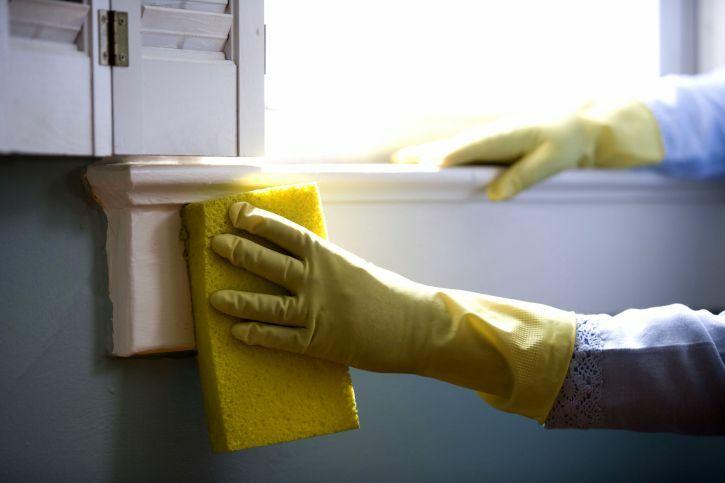 Doing this regularly will prevent dust from collecting in your home. Stainless Steel: What’s the point of having nice, shiny appliances when you don’t keep them shiny? Using either a specialty stainless steel cleaner or vinegar, wipe down your stainless steel in the same direction of the grain using a microfiber wipe, coffee filters, or paper towels.